On December 28, 1920, Alexander Woollcott reviewed The Provincetown Players's The Emperor Jones, which had transferred from its smaller venue on Macdougal Street to the much larger Selwyn Theatre: "Of course Charles Gilpin continues to give his amazing and unforgettable performance as the quondam Pullman car porter turned Emperor on a far-away island." 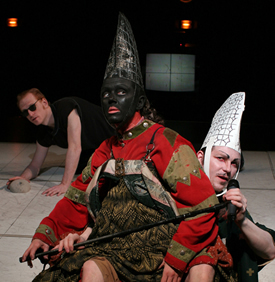 Now that the Wooster Group's Emperor Jones has made the move from the Performing Garage in 1998 to St. Ann's Warehouse in 2006, one can echo Woollcott: "Kate Valk continues to give her amazing and unforgettable performance as the quondam Pullman car porter turned Emperor on a far-away island." There are many things to be said about the differences that this echo conceals, and I have learned much from reviews of and essays about the 1998 production by Michael Feingold, Jonathan Kalb, Ben Brantley, and Aoife Monks. These writers are especially compelling about the ways Valk's highly stylized handling of the role of Brutus Jones unsettles the complex performance history of O'Neill's play, a role that helped to establish the career not only of Gilpin but also of Paul Robeson. I am especially interested, however, in the way the last words of Woollcott's sentence still fit: The Wooster Group's Brutus Jones is also a "quondam Pullman car porter turned Emperor on a far-away island." Critics have pointed again and again to the ways this production reveals race to be a masquerade, how Valk's performance, with its stereotyped minstrel intonations, embodies, in Charles Isherwood's phrase, "a simulacrum of a stereotype." This Emperor Jones becomes the theatrical realization of arguments about the performative nature of race that have roiled the academy and, arguably, been the basis of mass cultural works from Dave Chappelle skits to Spike Lee's underrated Bamboozled and onward. But where is this "far-away island"? The Wooster Group only continues the erasure of other political contexts that have marked productions since 1920. O'Neill's text sets the stage with a remarkable direction describing the location of The Emperor Jones: "The action of the play takes place on an island in the West Indies as yet not self-determined by White Marines. The form of native government is, for the time being, an Empire." Each of these sentences turns on a paradox: self-determination turns out to be determination by U.S. military power; "native government" takes a form perfected by the West, Empire. To emphasize these contradictory formulations is not to suggest that the Wooster Group continues the tradition of missing O'Neill's political acumen, but to emphasize that the play is itself not only a fiercely problematic staging of "race." It is, more narrowly and even more troublingly, a play about the possibility of African-American self-determination, a play about politics. "Playing a man falling prey to atavistic fear bred in his bones by centuries of history," writes Isherwood, "Ms. Valk performs with a fearlessness that commands something akin to awe." On the one hand, O'Neill's stage direction registers deep suspicion of the idea that occupation by "White Marines" can provide the basis of self-determination. On the other, the play is the symptomatic expression of a rather different "atavistic fear": the white fear of black rule. It is as though The Emperor Jones translates the perceived political threat of black rule into a tragedy of atavism that decrees that black self-determination can only be comic. Dere's little stealin' like you does, and dere's big stealin' like I does. For de little stealin' dey gits you in jail soon or late. For de big stealin' dey makes you Emperor and puts you in de Hall o' Fame when you croaks. (reminiscently) If dey's one thing I learns in ten years on de Pullman ca's listenin' to de white quality talk, it's dat same fact. And when I gits a chance to use it I winds up Emperor in two years. To ask that the Wooster Group offer some easily legible political lesson would be silly. But the discomfort the production provokes is not only the result of its "fearless" transcription of a long history of stereotyped representation. (Or representations: Smithers, too, is a cartoon Cockney.) It also stems from the Wooster Group's perpetuation of the longstanding white American myth of black power so tragically misguided that it becomes comic, or so comically misguided that it becomes tragic. One might argue that the production subversively undermines this myth just as it explodes the fixity of race imagined as a set of behaviors. But does it? The play names one of the two locations of black power arguably central to O'Neill's composition of the play. By making Jones a former Pullman porter, O'Neill identified -- perhaps without recognizing it -- a powerful presence in U.S. culture that was to become a force in the early Civil Rights movement. Even while the duties of Pullman porters required, historians have argued, a certain minstrel-like enactment of their supposed happy contentment as servants in elegant railroad cars, their unusual mobility produced new forms of political awareness and made them important conduits of information among black Americans. The other, unnamed location of power returns us to the question of that "far-away island." Suppose we remember O'Neill's placement of this island not in some geographical Never Never Land, but in the West Indies. Suppose, that is, we call this place Haiti. Haiti was in fact "self-determined by White Marines" when The Emperor Jones was first staged in 1920, and its history informs the play's representation of Jones's violent rule and the background fear of violent popular rebellion. Indeed, a popular uprising against Jean Vilbrun Guillaume Sam in 1915, which ended with the ripping apart of his body and the parading of the remains, was the pretext for the U.S. occupation, which ended only in 1934. O'Neill's biographers confirm what any scanning of recent history would in any case suggest: Haitian events were among the play's inspirations. This historical and political context has disappeared from the Wooster Group's staging of The Emperor Jones. One might argue -- and Woollcott is evidence -- that it has almost always disappeared from productions of the play. Surely the Wooster Group's unrelenting exploration of the production of a stereotype is a triumph; their re-framing of that production with a set of media at once absolutely primitive and technologically sophisticated, from blackface makeup to video monitors, remains startling. 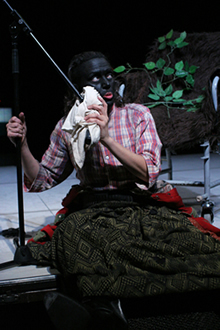 Valk's vivid red neck, too, suggests the white performers of early minstrel shows and the ways that blackface emerged, to borrow Michael Rogin's phrase, out of white noise. But one of the frequencies this white noise burlesques is the very idea of black self-determination. What if the Wooster Group were to tune into that? Emperor Jones photos copyright Paula Court. All rights reserved.